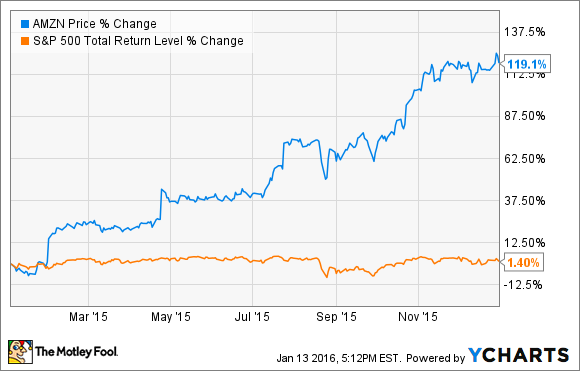 Will 2016 Be Amazon.com, Inc.'s Best Year Yet? After seeing its stock more than double last year, here's how the online retail juggernaut could continue its streak in 2016. But at the risk of taking a "What have you done for me lately?" approach, I can't help but wonder: Will 2016 be Amazon.com's best year yet? With the caveat that no investor can -- at least with any reasonable degree of certainty -- accurately predict where Amazon stock will end when all is said and done this year, we can offer an educated look at where its actual business is headed. And if Amazon's recent results are any indication, I think 2016 should prove to be another banner year. First, Amazon's market-beating 2015 came on the heels of four consecutive quarterly revenue and earnings beats. Most recently in October, Amazon announced that third-quarter revenue grew an amazing 23% year over year (30% excluding currencies) to just under $23.4 billion, including a 15.2% increase in product sales to $18.5 billion, and a 51.3% increase in service sales to $6.9 billion. Meanwhile, net income swung to $79 million from a $437 million net loss in the same year-ago period. But arguably more important to knowing Amazon's future direction is understanding the driving forces behind those results. More specifically, note that revenue from Amazon Web Services skyrocketed 78% over the same period to roughly $2.1 billion. And though that's still just over 8% of Amazon's total sales, AWS's impressive 25% operating margin meant this segment alone generated operating income of $521 million. For perspective, Amazon's North American retail segment generated only slightly higher operating income of $528 million on net sales of $15 billion, and its yet-to-be-profitable international segment translated revenue of nearly $8.3 billion into an operating loss of $56 million. In short, as bearish investors fret over the low margins Amazon seems destined to suffer given the nature of its core retail operations, the growing contributions of AWS should serve as a perfect complement to rapidly increase Amazon's profitability. In the meantime, Amazon's current guidance for the fourth quarter calls for net sales between $33.5 billion and $36.75 billion, representing year-over-year growth of between 14% and 25% from last year's record holiday quarter. Perhaps in a testament to Amazon's habit of over-delivering, analysts' consensus estimates call for revenue near the high end of that range, at $36 billion. But that optimism shouldn't be entirely surprising. Two weeks ago, Amazon confirmed it had a stellar holiday on multiple fronts. Its Prime service, for example, signed up more than three million new members worldwide in the third week of December alone. Meanwhile, Prime members doubled their viewing hours of Prime Video titles over the holiday season, showing thatAmazon is succeeding in its efforts to make its popular subscription even stickier through services complementary to the core shipping incentive. In fact, according to a recent report from analysts at Cowen, Amazon has now grown its Prime member base to a 41 million people, spanning an incredible 38% of all households in the United States. In addition, Amazon says it sold twice as many Amazon devices this season than in last year's record holiday, which helped make its all-new Kindle Fire the No. 1-selling product on all of Amazon.com. At the same time, this means Amazon is also succeeding in promoting its growing ecosystem of devices and digital services to consumers, which should further serve to bolster its core retail operations. Trending toward the bottom line, Amazon expects that to translate to an (admittedly wide) operating income range of between $80 million and $1.28 billion. But if AWS continues to deliver its outsized growth, don't be surprised if Amazon significantly improves upon the $591 million in operating income it achieved in the fourth quarter of 2014. Of course, we're still technically only referring to Amazon capping 2015 on a high note. But given the nature of its retail growth, Prime membership growth, and growth and outsized profitability of AWS, Amazon is well-poised to sustain this momentum into the new year. To be sure, while consensus estimates call for Amazon's full-year revenue to climb roughly 20.5% when all is said and done in 2015, Wall Street is also anticipating Amazon will accelerate its year-over-year top-line growth to 20.9% in 2016. Of course, we should receive our first glimpse of whether that will be the case with Amazon's upcoming quarterly report later this month. But I won't be the least bit surprised if Amazon shocks the market by guiding for yet another stellar year.